I wanted to message to say thank you - what a brilliant blanket. Way better than I expected. Well done. Thank You so so much for your really nice package. My daugther will be so happy about that, if she come home from Kindergarten. The stamp is really awesome and its so nice from You to send sweets. Thank you all. Good Job guys, really good Job. Oh goodness I ordered several personalised door mats as presents for friends which have arrived today and I am thrilled with the quality and delivery - thank you. Just recieved the photo blanket. FANTASTIC ! I did not really think it would be so good on a fabric surface, but you have reproduced the photo superbly. My wife will be thrilled with it. Extremely awesome quality. Delivery very quick. We were surprised and really happy. We ordered a blanket in biggest size to put over a (double)bed. Fantastic, really. Even old scanned blackwhite photos, kind of dizzy looking in the old album, came out clear and nice on the blanket. WOW. Thank you to all the team at Personalised Blankets,delighted with the speedy delivery of a fantastic quality material and wonderful design. Will be buying from ye again for sure. Sincere thanks. 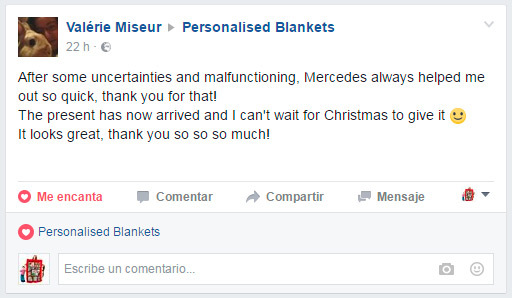 After some uncertainties and malfunctioning, Mercedes always helped me out so quick, thank you for that! The present has now arrived and I can't wait for Christmas to give it :) It looks great, thank you so so so much! I have received the rug today and i can say i am EXTREMELY pleased with it!!! The quality of the photos are AMAZING! 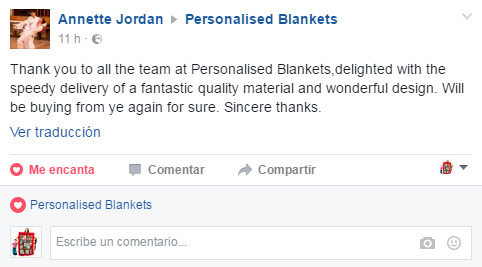 Your Customer service is perfect and delivery was Very Fast indeed!! Thank you so much ..i will certainly be using your business again. If at all possible i would like to leave a comment as your service needs to be recognised more! I have now received my order & very pleased with it. Thank you. I would just like to say a massive thankyou for the blanket that was delivered today. It was a 21st birthday present for my daughter and she absolutely loves it. I already have a few friends that want one. Thankyou. Thank you so much for your gorgeous order! It was my Mums present for Mothers Day. I gave it her early because I wasn't going to see her. She cried because she loved it that much! Perfect quality, 10/10 for everything! Will be ordering again! I know some months have elapsed since my daughter received the blanket I ordered through your company, but I have been meaning to email and Thank you so much for the Wonderful job you made of the blanket. 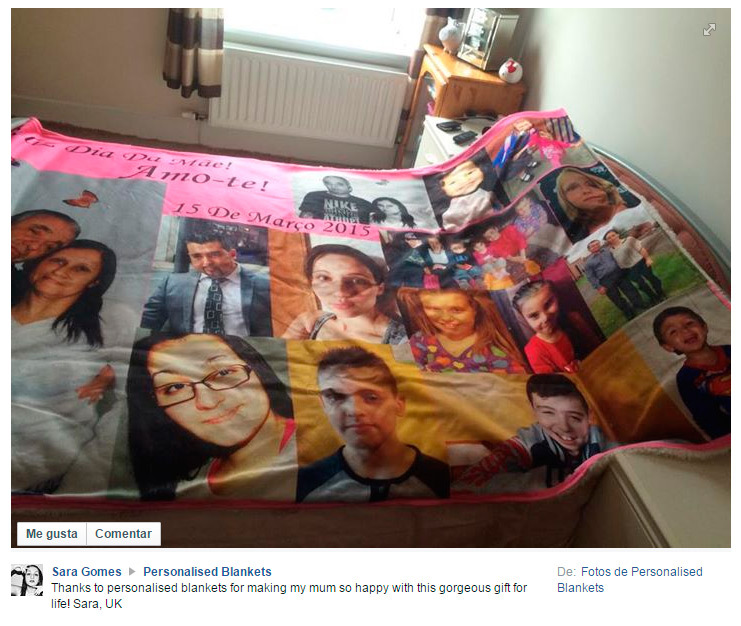 I live in Australia and our daughter has been living in London for the past 12 months, so for her to receive the blanket with photos of special people from home and also places she has travelled meant so much to her. The clarity and brightness is amazing and once the order was finally placed, the delivery time frame was exactly as you had quoted. Congratulations on a job Well Done. Once again Thank You so Very Much for such a beautiful product. Thank you so much, my blanket arrived safely today. It is fantastic, I will recommend you to everyone! Wow! Was panicking bit that the blanket I ordered wouldn't be here in time but it came today. I could not be more thrilled! The quality if the pictures is excellent and the blanket high quality. Perfect and great value. Five stars! Can't wait to give it tomorrow morning! I will be ordering from you again. The blankets have arrived, and they look fantastic. Thank you so very much for the fast and excellent response, you have really made me very happy! Just wanted to say how pleased I am with my order. The blankets and towels are fantastic and will be very appreciated at Christmas as they were bought as gifts. Thanks so much. I have orderd two plankets from you and they arrived last week. I just want to thank you for your beautiful job. They are so nice and I love them. Thank you and Merry Christmas! Good afternoon, I just recevied your parcel. And I am very very happy with the blankets and the colour they are. Thank You for this. Hello there, my polar blanket has arrived! Thank you so very much for yout service. The blanket looks amazing!!! It has arrived today and is amazing thank u for doing such a great job. I just wanted to tell you that I have finally received my blanket and to say I am very pleased with it. Again thank you for your service and I would use you again. Just received the blanket I ordered from you and its PERFECT!!!! Ordered for my Dad who is now 89 years young, and tricky to buy for re Christmas, so he now have a blanket with a collage of all our family, something he ca, wrap round his knees, with love of his family, something that will bring a lot of joy. Superb idea, and thank you so very much!!! Thank you for the wonderful watches! Hi, thank you for your reply. I got the order already. It was fast and everything looks good. I will be ordering more from you! Thanks again! I have the blanket inside and he is unwise cool! Thanks again for all the cooperation! I just got my towel and it's so nice. And what is the quality great. This is something I will recommend to my friends. Now no longer have to think of what to give people on their birthday, for example. Thank you very much. My order has just arrived! It looks fantastic, thank you to you and your team. I will definitely be recommending to my friends! We have just received the blanket and we are so so so happy with the outcome.Its so clear and we just love it. Thanks!!! Can't wait to give that for my grandpa on he's 80 birthday's in July! He's gonna be for sure in big shock. 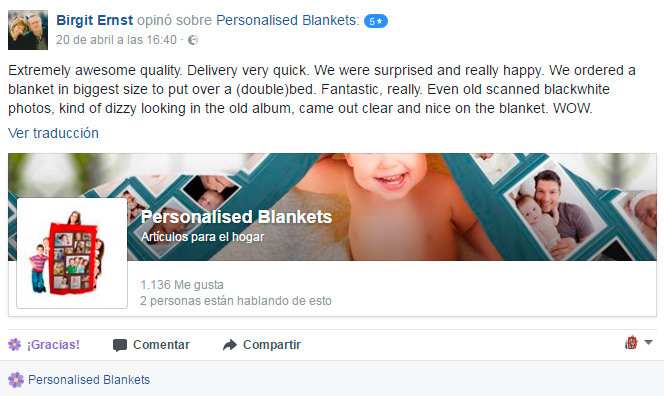 For sure I'm gonna be a returning customer, because blanket's like that is a perfect gift for many occasions! I'm also highly recommend Your's service to my friends. Kind regards! Thank you very much. The towel is perfect! Big thanks for the service. Many thanks. The blanket is so so Nice! Regards! 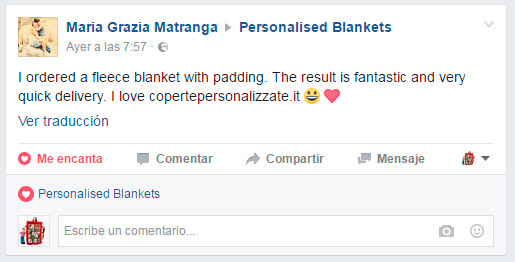 I bought two personalised polar blankets from you and was very happy with the quality of them and the efficiency of your service. Thank you and I will definitely purchase from you again. Today the polar blanket came and this time it is lovely! Thank you very much for the good service. Thank you for my blanket , is cosy , warm and soft! Thanks a lot. So happy with the blanket, it's amazing. I will definitely be ordering more from you and recommending you to friends and family. Thank you very much. I've just received my blanket and I love it so much that I want to order another one!! Thank you for your prompt reply, much appreciated. I shall certainly be recommending your company based on your excellent after sales service. Received my blanket this morning and would like to say how pleased I am with it. I will certainly recommend your company and would use you again myself. Many thanks. Just want to say I received my Blanket today and wanted to say wow. I'm very very happy. My other is going to love it. The quality was fantastic and the pictures printed better than I thought it would. Many many thanks. 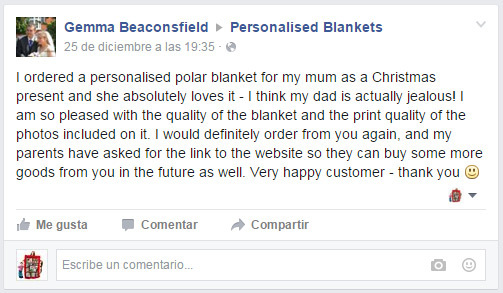 I will definitely use your services again and would definitely recommend you for that something different gift. I am writing to you to say how pleased I am with my order,I will certainly recommend you to friends,it was a quick service.Thankyou. I've revieved the beautiful blanket you made for my friend it is the most beautiful thing we've ever seen! I can't thank you enough!